[PDF] International Marketing & Export Management (7th Edition) | Free eBooks Download - EBOOKEE! Description: International Marketing and Export Management 7th edition offers an accessible and authoritative perspective on international marketing with a strong export management orientation, comprehensively describing the evolving competitive landscape as created by technological advances and international trade patterns. The seventh edition retains its clear and informed coverage of the opportunities for companies of all sizes and in all industries in the export of goods, services, intellectual property and business models. Written in a no-nonsense style, the bookhas been updated to offer the most up-to-date discussion of the literature in the area, as well as new and engaging cases and examples in every chapter. 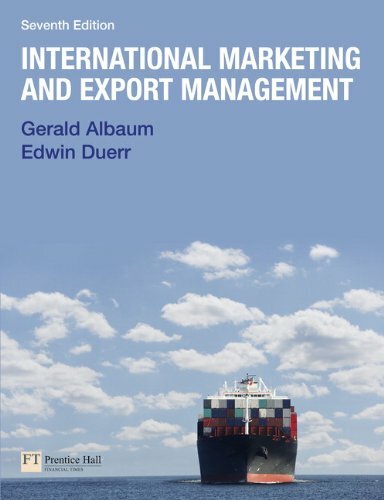 The book is ideal for undergraduate and postgraduate students taking modules in International Marketing and Export Marketing/International Trade. It will also be used as a supplementary text on International Business courses. No comments for "[PDF] International Marketing & Export Management (7th Edition)".